To meet the Middle East’s urgent need for improvement to its security architecture, the conversation must evolve beyond the notion that the region should adopt the arrangements that have succeeded elsewhere. Regional states need to build upon their own traditions of cooperative security in a way that acknowledges their strengths, limitations, and differences from other regions. This policy report seeks to lay the groundwork for such an effort by identifying a number of factors that have contributed to the lack of a formal security architecture—such as the region’s lack of common existential threats—and the role that security institutions traditionally have played across the Middle East. This policy report is part of “Order from Ashes: New Foundations for Security in the Middle East,” a multiyear TCF project supported by the Carnegie Corporation of New York. Political theorists have long considered the Middle East to be the only region in the world that lacks a comprehensive regional security architecture. Europe relies on formalized mechanisms such as treaties and institutions, and countries in Asia have used diplomacy and consensus in pursuit of their regional security regimes. The countries of the Middle East, however, are often said to not even share a common set of norms or guiding principles in the realm of security. This view is, however, incomplete. To some degree, it judges the Middle East by the wrong scale—a scale largely formed around Western security arrangements, which are not the only ways that security can be managed. This report argues that, while the Middle East may not have an institutionalized security architecture characterized by binding commitments, states in the region are nonetheless engaging in cooperative security, albeit in a way that differs drastically in form from those in other regions. This does not mean that the Middle East is not in dire need of improvement to its security architecture. The region currently faces numerous threats to security, including concerns of instability and unpredictable outcomes. Many contemporary security threats are products of the factors that contribute to the region’s lack of formal architecture. The ongoing conflict in Syria displays the immediate need for a more robust formal security system, the diplomatic crisis with Qatar points to divergent political interests within the Gulf Cooperation Council (GCC), and the instability in Yemen and the renewed insurgency in Egypt’s Sinai region further emphasize the region’s needs for greater cooperation. To address these urgent security needs, the Middle East needs to build upon its own established traditions of cooperative security, in a way that acknowledges the region’s strengths, limitations, and differences from other regions. This report seeks to lay the groundwork for such an effort by identifying concrete factors that have contributed to the lack of a formal security architecture, such as the region’s lack of common existential threats, and examining the role that security institutions traditionally have played across the Middle East. To address contemporary security threats in the region, it is critical to first identify the factors that have contributed to this lack of formal security architecture. In identifying these factors, though, this analysis also refutes the notion that the region is somehow “exceptional” and thus incapable of building a robust security architecture. To move the conversation beyond received and incomplete notions about the Middle East—and toward solutions for the region’s security—it then expands the notion of security beyond military and political dimensions, and assesses the various social and cultural linkages between states, and their effects on regional security. This report is part of “Order from Ashes: New Foundations for Security in the Middle East,” a multiyear TCF project supported by the Carnegie Corporation of New York. The notion of security has often been referred to as being an “essentially contested concept.”1 Scholars believe that the definition of security is inherently subjective, as it means different things to different people or states. In the most rudimentary sense, however, security means alleviating threats to established values.2 Following this basic definition of security, cooperative security therefore refers to the mutual collaboration of a group of states to mitigate threats caused by a common set of identified concerns. Before proceeding further, however, it is worth briefly distinguishing between the concepts of cooperative security, collective security, and collective defense. Collective security refers to a group of member states that are legally obliged to protect each other from an attack by other states within that same group.3 An example of a collective security organization is the Organization for Security and Co-operation in Europe (OSCE). Collective defense, by contrast, refers to the commitment of member states within an organization to defend each other from external aggression.4 NATO is the foremost example of such an alliance. Cooperative security has completely different connotations. The term was largely popularized in the years following the end of the Cold War, and it accurately captured the zeitgeist of that era—an overwhelming sense of optimism for the new world order. Carrying the spirit of that time, then, cooperative security has been identified as connoting “consultation rather than confrontation, reassurance rather than deterrence, transparency rather than secrecy, prevention rather than correction, and interdependence rather than unilateralism.”5 Thus, whereas collective security describes the process of shared legislation to ensure internal order and collective defense involves shared legislation in addition to the commitment to align against external threats, cooperative security simply suggests mutual collaboration to alleviate an internal or external threat to some shared values. To examine the Middle East’s security architecture, this assessment focuses mostly on the elements of cooperative security, not on those of collective security or collective defense. Arab leaders pose for a group photo during the Arab League summit in the Jordanian Dead Sea resort of Sweymah, Jordan, March 29, 2017. Source: Jordan Pix/ Getty Images. Although a formal security architecture shaped European policy, other regions currently maintain informal or at least less formal regional security systems. Informal cooperation typically involves quiet or Track Two diplomacy, which consists of unofficial discussions among nongovernment actors. Such less formalized systems are not necessarily less developed, but they may not have the same structures found in more formal systems. For example, East Asia developed its informal system out of a desire for sovereignty. Because the region did not face an imminent common threat such as the Soviet Union in Europe, its regional system focuses on national independence, nation-building, and economic development.8 This kind of quiet diplomacy contrasts significantly with other systems, in that it encourages the bilateral resolution of tensions between member states. The political theories related to the concept of security architecture and cooperative security have predominantly European and American roots. As a result, it should not be surprising that international concepts of security architecture have Eurocentric and U.S.-centric views that may not translate or apply easily to other regions. The most appropriate security architecture for a particular region depends heavily on the region’s context and history. The Middle East has frequently been referred to as a “region without regionalization,” which is reflected in its relative lack of political and economic arrangements and integration.9 Regional security arrangements are even more conspicuously absent. However, a look at the Middle East’s subregional arrangements and informal security arrangements reveals the ways in which countries within the region have approached some of their more pressing security questions. Regionwide approaches to cooperative security in the Middle East have never been effectively actualized. Nonetheless, the region has a long history of cooperative security attempts at the subregional level, in which some security arrangements have exhibited strong features of a security architecture. A number of these cooperative security endeavors, however, have not been successful at achieving their intended objectives; although it is difficult to generalize from these examples, more often than not the shortcomings of some of these arrangements reflect how states within the region are more likely to emphasize their shorter-term interests. One notable exception is the GCC, the arrangement between Gulf states. The GCC is a distinct model of successful security cooperation in and one of a few regional examples of a formalized, institutionalized security arrangement. On the surface, the GCC appears to be a purely political and economic agreement, and its objectives (as stated in its official charter) are “to effect coordination, integration and inter-connection between Member States, to deepen and strengthen relations, and to formulate similar regulations in the fields of economic and financial affairs, commerce and customs, and education and culture.”10 Although the charter makes no overt references to security, the timing and geopolitical environment of the establishment of the GCC suggest that its founding members’ security requirements were one of the basic underpinnings for the arrangement—the GCC was founded in 1981, in the wake of the 1979 Iranian Revolution and the start of the Iran-Iraq War, which began in 1980 and would grind on for nearly a decade. At the time, the six Arab countries of the Gulf perceived Iran as a common threat. The GCC also established a joint defense force, known as the Peninsula Shield Force, in 1984. Although the Peninsula Shield Force has seldom been active, it has been deployed several times, including during the 1991 Gulf War and in Bahrain following the Arab uprisings of 2011. However, even the GCC is not immune to internal disputes and incomplete integration. In 2017, for example, Egypt and three GCC countries—Bahrain, Saudi Arabia, and the United Arab Emirates—cut off diplomatic ties with Qatar, another prominent member of the GCC, citing Doha’s supposed support for terrorism. In addition to the formalized and institutionalized model of agreements, the Middle East also has had many unofficial security cooperation arrangements between countries and even nonstate actors on a subregional level. These types of arrangements are notably different than the strategic cooperation required to build a common architecture; often, they are motivated by common immediate interests and can shift significantly over time. Cooperation between Iran, Qatar, Syria, and even Hamas and Hezbollah before the uprisings of 2011 is a good case in point. At the onset of the conflict in Syria, it was impossible to sustain this arrangement, leading to outright enmity between some members of this grouping. This is not the only time in the Middle East that loosely affiliated partners have turned against each other. Even on a subregional level, evidently, some alliances can lead to cooperation, accommodation, and coordination on security matters, but do not necessarily encourage the development of a common security architecture. An Iraqi awakening Council member stands guard as Iraqi army soldiers stand near by on September 10, 2008 in Gazaliyah neighborhood north west of Baghdad, Iraq. A decrease in violence allowed both Shiite and Sunni internally displaced families to return to their homes after fleeing about two years earlier due to sectarian violence. Source: Wathiq Khuzaie /Getty Images. The informal way in which politics and security are practiced in the Middle East and the lack of documentation of visible or public security arrangements such as treaties has led many analysts from outside the region to observe that no such arrangements exist at all. But the use of discrete diplomacy using intermediaries such as tribal, religious, and business figures is quite common in the region—and counts as a kind of security arrangement. Observers from societies with strong textual traditions of diplomacy, such as Europe and the United States, frequently misinterpret the diplomatic methods and approaches of societies with strong nontextual traditions, like many societies in the Middle East. This is both a contemporary and historical problem for the Middle East. The Great Arab Revolt of 1916, for instance, was assumed by European historians to have been driven and conceptualized by intellectuals in the Levant primarily because much of the textual evidence supporting the idea of an “Arab Awakening” was present only in the Levant. However, the Levant also happened to have the only printing press in the Arab world, which missionaries had brought to Beirut from Malta in 1834.11 Meanwhile, these same observers commonly believed that many in the tribal hinterland of the Arab world did not have a similar intellectual awakening—purely because of these populations’ scarcer textual evidence and greater dependence on oral traditions. In a more contemporary context, the Awakening Council (also referred to as the Anbar Awakening) movement in Iraq, later appropriated as a component of the George W. Bush administration’s 2007 “surge,” is an example of an informal regional security arrangement. The United States enlisted the council’s help to fight al-Qaeda and its affiliates, in return for what turned out to be unmet promises to incorporate Sunni tribesmen into Iraq’s armed forces. Though the United States was critical to this effort, it would not have been possible without the tribal links that connected some of the tribes in the Emirates, Jordan, and Saudi Arabia with those in Iraq. Nor would it have been possible without the coordination between the security institutions of those countries. Despite these aspects, there is little literature or documentation supporting this claim. There are several reasons that may explain why the Middle East has no visible and formal security architecture akin to those in other regions. As mentioned earlier, other regions have established cooperative security arrangements based on certain common guiding principles that have helped them develop their regional security regimes. The few successful examples of such arrangements in the Middle East outlined above, such as those of the GCC, have been resilient in the face of shifting regional dynamics because they possess this kind of common guiding principle. On the whole, however, the Middle East is held back by a number of contributing factors that have hindered the establishment of such a formal architecture. The fact that there is no regionwide consensus on a shared vision for future prosperity ultimately underpins each of these factors. The following section outlines the most prominent of these factors, though this is by no means an exhaustive list. 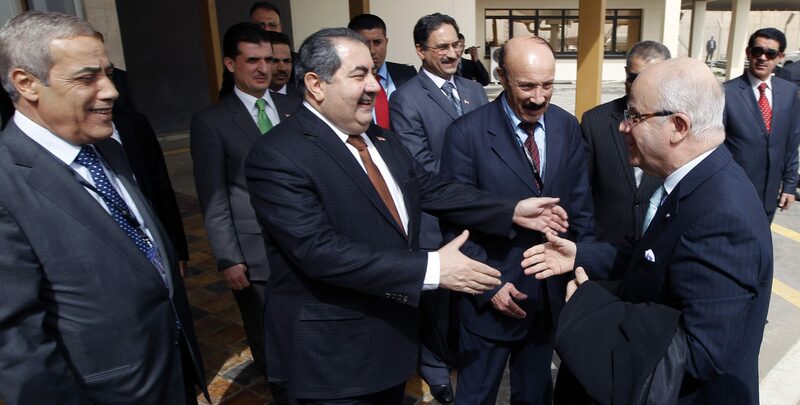 Iraq’s Foreign Minister Hoshiyar Zebari (L) welcomes Algeria’s Foreign Minister Mourad Medelci before Arab foreign ministers meeting at Baghdad’s airport as part of the Arab League Summit on March 27, 2012 in Baghdad, Iraq. The Arab leaders will meet in Baghdad for the 23rd regular session of Arab summit on March 29. Source: Mohammed Ameen-Pool/Getty Images. One of the most significant factors that contribute to the lack of a formal architecture is that the Middle East is a large geographic region with multiple subregional threat perceptions. Cooperative security, by definition, “refers to a system in which a group of states that have identified a common set of security issues or concerns thereby establish a set of rules of conduct, and a mechanism to discuss their concerns, in order to develop more predictable relations.”12 In the Middle East, however, outside actors may be the source of real or imagined existential threats, but such threats have never been universal enough to warrant a common architecture. Furthermore, many regional actors also regard certain outside actors as essential components of regional security arrangements. Ultimately, states across the region do not always perceive security threats with the same urgency that their neighbors do. For instance, officials in Morocco or other countries in the Maghreb—the Arab states of western North Africa—may consider Western Sahara’s independence movement to be the greatest threat to their national security. It is difficult to see, however, how this concern would resonate with officials in the Levant or the Gulf Arab countries, who are more likely to consider Israel or Iran to be the greatest threat to their security. At the end of the 1970s, it was precisely a mutual concern about Iranian expansionism—namely, the export of Iran’s Islamic Revolution—that rallied the Arab countries of the Gulf to form the GCC. Even Israel, a security concern for a majority of states across the Middle East and North Africa region (and, therefore, a common security denominator), does not evoke the same level of threat perception in different states. Without a common existential threat similar to the one that existed in Europe during the Cold War, the Middle East does not have the same impetus for genuine security cooperation. As previously demonstrated, countries often have more successful experiences with subregional security arrangements, particularly because they share common threat perceptions. The comparative experience from other regions has shown that engagement in regional cooperative security requires states to share mutual perceptions regarding security threats. Similarly, a successful regional security architecture can also be based on preexisting cooperation beyond political and military dimensions. Factors such as economic integration and trade patterns between states in the Middle East therefore warrant consideration. Notwithstanding the economic performance of the GCC countries and the high level of integration between their economies,13 the Middle East as a whole is one of the world’s least economically integrated regions. In spite of a number of efforts since the 1950s to promote Arab economic integration, research has consistently found that regional trade agreements, with the exception of the GCC, have done very little to promote trade.14 Intraregional trade in the Middle East accounted for only 9 percent of its total exports—the lowest proportion of any region in the world, far below Europe at 70 percent and Asia at 52 percent.15 The reasons for the region’s poor economic interdependence are numerous, but generally can be attributed to its weak economic institutions, high trade barriers, high costs of doing business, and inward-looking policies. There is a vast literature on the relationship between economic interdependence and security cooperation.16 Admittedly, the international relations discipline does not always agree on the reasons for these connections—liberal perspectives state that economic interdependence lowers the likelihood of war by increasing the value of trading over the alternative of aggression, whereas realists argue that interdependence actually increases the probability of war as it increases vulnerability.17 Realists often justify this outlook by citing the example of World War I, which broke out between European countries in spite of their deep, extensive economic ties. Viewed from the perspective of the post–Cold War world order and into the twenty-first century, however, the growing trend toward regionalization and the tendency for regional institutions to be involved in comprehensive security more strongly supports the liberal viewpoint of economic interdependence and conflict. Yet with respect to comparative examples from other regions, the majority of regional security architectures either include cooperation on economic matters, such as in the European and Gulf architectures, or had pursued economic cooperation before establishing security cooperation, such as in Asia and Latin America. When the League of Arab States was established in 1945, its mission was to improve coordination on issues of common interest between its six member states (there are now twenty-two). Even though the Arab League is considered to be one of the region’s most far-reaching organizations in terms of its geographical inclusivity and broad membership, it has often been criticized for being ineffective and for representing, at best, a “bleak experience of regional cooperation,”18 particularly when considered in the context of conflict management. The Arab League has been involved in resolving disputes, but it has also been accused of lacking the capacity or the authority to impose its will on member states or to bridge their fundamental ideological fissures. Even in the 1991 Gulf War—a case where the majority of Arab countries shared the Arab League’s official position against Iraq’s invasion of Kuwait—it was the international community and an international coalition that drove out the Iraqi forces. A number of quantitative studies have analyzed the Arab League’s efficacy in terms of conflict resolution. One of the most comprehensive of these studies examined conflicts in the Middle East and the interventions of the Arab League from 1945 to 2008.19 The study found that of approximately fifty-six conflicts across the region during the time period, the Arab League intervened in nineteen. Of those interventions, the study regarded just twelve as successes; of those, only five could attribute the primary cause of success to the role of the Arab League. The Arab League’s inconsistent record of intervention may stem from the fact that is has never been focused primarily on security. Article II of its charter, which defines the League’s main purposes, does not explicitly mention security.20 There are also some common views that the Arab League was formed as a mechanism to keep regional power imbalances in check. Even though the League’s charter does not mention security, the organization did conclude a Joint Defense and Economic Cooperation Treaty in 1950. This treaty, often referred to as the “Arab Collective Security Pact,” guaranteed an increased level of cooperation against external threats between member states.21 The treaty was responsible for the establishment of the Arab League’s Joint Defense Council, but this council is mostly considered a failed experiment in collective security, especially when assessed in light of the 1967 Arab-Israeli War—one of the region’s most pivotal conflicts, yet one in which the Arab League did not intervene. Just as the Arab League does not always represent the positions of the majority of its member states, it also (and even more so) does not necessarily represent the views and priorities of those states’ security establishments, which are overwhelmingly represented by their militaries. This is an essential deficiency, because Middle Eastern states’ security establishments are many countries’ most important institutions, arguably the most developed and best established relative to other institutions. It is difficult to engage regional states in a meaningful and inclusive security dialogue without the direct involvement of their security establishments, particularly when—for reasons too complex to enumerate here—there is broad mistrust between them. Indeed, a zero-sum mentality prevails: one country’s security is seen as necessarily coming at the expense of others’. Any successful proposal for cooperative security will need to involve national security institutions as part of the discussion. A final key factor complicating the development of broader regional security mechanisms is the absence of a common political identity. Here the use of the term political identity is acutely different from cultural and emotional allegiance that many in the region may profess as part of their identity as Arabs. In the case of Europe, for example, the European Union remains the institutional embodiment and expression of a common European political identity, even in spite of its numerous current and past difficulties and the fact that it encompasses many distinct ethno-national identities. Many Middle Eastern states share common languages, religions, and cultural heritages, but a common political identity remains well out of reach. The Middle East, in contrast to Europe, continues to struggle with the issue of competing national, subnational, and confessional identities. International relations scholars have long debated the issue of political identity in the region, and the literature appears to indicate an overwhelmingly shared view (albeit not a universal one) that the identification with the territorial state has historically and generally been tenuous with regard to other identities such as tribe, ethnicity, religion, or sect.22 Even at the state level, national political identities are relatively weak, challenging the European model of the nation-state. It is little wonder that this environment has made it all the more difficult to encourage the development of shared, inclusive political identities across states—especially when those identities are at odds with the interests of some states. It is difficult to overstate the urgency for better security architecture in the Middle East. According to the controversial 2017 Fragile States Index,24 almost three-fourths of all governments in the Middle East were among the more fragile half of countries, with Iraq, Syria, and Yemen in the top ten. This high potential for state fragility is a major concern not only for individual countries but also for the region’s overall security. If a system for cooperative security is to be developed, its architecture must both address this fragility and be able to withstand it. The deterioration of stability after the Arab uprisings of 2011 has further demonstrated the increased necessity for a system that can withstand such disruptions and mitigate their impact, while also preventing the outbreak of conflict. One hopes that from the ashes of this century’s conflicts, regional states will draw some lessons about security, and act on them. The consequences of the Syrian conflict in particular may move countries in the region to begin deep and long-lasting security coordination with a view to further their common security. The war in Syria raises important questions for how a regional security system in the Middle East should respond to distinct threats: conflicts between regional states, including through the use of proxies, the threat of nonstate actors, and intervention from extraregional actors. Yet at the same time, the Middle East region is far from being in a position to adopt the types of security architectures that exist in Europe and Asia, though many in the international community continue to call for such a system. And in light of the region’s particular needs, it should not attempt to do so—at least not if it prevents other, more practical steps to achieve regional security aims. None of this analysis should imply that work to build a regional security architecture should be abandoned. But when working to develop such a system, states must distinguish between what is desirable and what is achievable. Although it is essential for international partners to support this process, they will need to help strike the right balance between considering international models and incorporating regional realities. Contemporary security threats posit three major concerns that any proposed security system must address: how a cooperative system will respond to governments that pose a threat to stability; how the region will respond to nonstate actors, as well as the rise in violent insurgency; and how the region can balance intervention from external actors while also maintaining autonomy over its security. Of course, these are not the only concerns, and any new security system will likely face significant obstacles and unique concerns. Likewise, the process of building a regional security architecture needs to adopt a long-term view and commitment with gradual milestones and periodic reviews. It must also be cognizant of its limitations and restrictions. For example, conflating the development of a regional security architecture with discussions between Arab countries and Israel on a zone free of weapons of mass destruction has not been a success, nor is it likely to be in the foreseeable future. Similarly, whereas attempts to develop a security architecture concept have largely taken place in Track Two discussions with academics and nongovernmental organizations from the region, the chances for success would be much greater if discussions were held on an official level—including, most importantly, the security establishments. Barry Buzan, People, States and Fear: The National Security Problem in International Relations (Brighton, UK: Wheatsheaf Books, 1986), 6. Paul D. Williams, Security Studies: An Introduction (London: Routledge, 2003). Richard Cohen and Michael Mihalka, “Cooperative Security: New Horizons for International Order,” Marshall Center Papers 3, George C. Marshall European Center for Security Studies, 2001. Gareth Evans, “Cooperative Security and Interstate Conflict,” Foreign Policy 96 (1994): 7. The Western European Union was a military alliance that existed from 1948 to 2011. Its responsibilities were gradually taken on by the European Union’s Common Security and Defence Policy. Hanns W. Maull, “Security Cooperation in Europe and Pacific Asia: A Comparative Analysis,” The Journal of East Asian Affairs 19, no. 2 (2005): 67–108. Paul Aarts, “The Middle East: A Region without Regionalism or the End of Exceptionalism?” Third World Quarterly, 20, no. 5 (1999): 911–25. “The Charter,” Gulf Cooperation Council, May 25, 1981, http://www.gcc-sg.org/en-us/AboutGCC/Pages/Primarylaw.aspx. Andrew Shryock, Nationalism and the Genealogical Imagination: Oral History and Textual Authority in Tribal Jordan (Berkeley: University of California Press, 1997). Peter Jones, “Towards a Regional Security Regime for the Middle East,” Stockholm International Peace Research Institute (SIPRI) Background Papers, SIPRI, 2011, 48, https://www.sipri.org/sites/default/files/files/misc/SIPRI2011Jones.pdf. World Bank, Economic Integration in the GCC (Washington, D.C.: World Bank, 2010), https://openknowledge.worldbank.org/handle/10986/27898. Bernard Hoekman, “Intra-Regional Trade-Potential Catalyst for Growth in the Middle East,” MEI Policy Paper, Middle East Institute, 2016. “International Trade Statistics 2015,” World Trade Organization, 2015, https://www.wto.org/english/res_e/statis_e/its2015_e/its2015_e.pdf. See Michiel De Vries, “Interdependence, Cooperation and Conflict: An Empirical Analysis,” Journal of Peace Research 27, no. 4 (1990): 429–44; Katherine Barbieri, “Economic Interdependence: A Path to Peace or a Source of International Conflict?,” Journal of Peace Research 33, no. 1 (1996): 29–49; Erik Gartzke, Quan Li, and Charles Boehmer, “Investing in the Peace: Economic Interdependence and International Conflict,” International Organization 55, no. 2 (2001): 391–438; and Edward D. Mansfield and Brian M. Pollins, Economic Interdependence and International Conflict: New Perspectives on an Enduring Debate (Ann Arbor: University of Michigan Press, 2009). Dale C. Copeland, “Economic Interdependence and War: A Theory of Trade Expectations,” International Security 20, no. 4 (1996): 5–41. Helena Lindholm Schulz and Michael Schulz, “The Middle East: Regional Instability and Fragmentation,” in Global Politics of Regionalism: Theory and Practice, ed. Mary Farrell, Björn Hettne, and Luk van Langenhove (London and Ann Arbor: Pluto Press, 2005), 187–201. Marco Pinfari, “Nothing but Failure? The Arab League and the Gulf Cooperation Council as Mediators in Middle Eastern Conflict,” Crisis States Research Centre Working Paper 45, 2009, http://citeseerx.ist.psu.edu/viewdoc/download?doi=10.1.1.630.5422&rep=rep1&type=pdf. “Charter of Arab League,” League of Arab States, March 22, 1945, http://www.refworld.org/docid/3ae6b3ab18.html. Raymond A. Hinnebusch, The International Politics of the Middle East (Manchester: Manchester University Press, 2015). Fragile States Index, Fund for Peace, 2017, http://fundforpeace.org/fsi/. Nasser bin Nasser is the managing director of the Middle East Scientific Institute for Security (MESIS) based in Amman, Jordan, and the head of the Amman Regional Secretariat. He promotes scientific and technological solutions to regional challenges, with a specific focus on chemical, biological, radiological and nuclear issues. Jasmine Auda is the deputy managing director at MESIS. Jasmine Auda is the deputy managing director at the Middle East Scientific Institute for Security (MESIS), supporting the design and development of programs that seek to address various risks to regional security in the Middle East. Jasmine received her undergraduate degree in political science from New York University, and a master’s degree in the political economy of the Middle East from King’s College London.